C’est Vous! 1959 Eastman Fibers advertisement featuring McCall’s 5020 and McCall’s 5099 by Pierre Cardin. 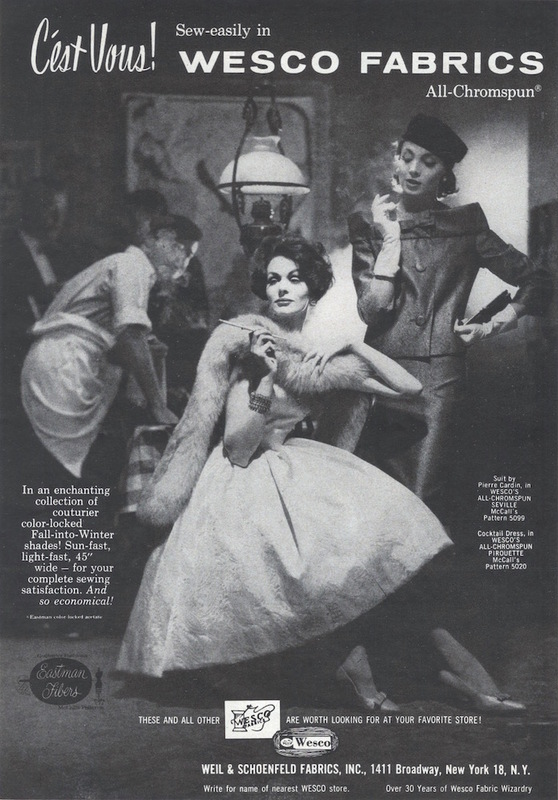 A 1959 Eastman Fibers ad brings a note of intrigue to McCall’s patterns by photographing them in a nightlife setting, on a pair of vampy women. The patterns are McCall’s 5020, a strapless cocktail dress, and McCall’s 5099, a skirt suit by Pierre Cardin, both shown in Wesco Chromspun fabrics. Chromspun is the trademark for Eastman colour-locked acetate yarn from Eastman Chemical Products Inc., then a subsidiary of Eastman Kodak—in those days headquartered on Madison Avenue. Looked up the 5099 (I really appreciate your links) and that collar is something else! And now I have to try it.